Implementation of an orthotopic model of renal cell carcinoma in immunocompetent mice affords the investigator a clinically-relevant system defined by the presence of a primary renal tumor and lung metastases in the same animal. This system can be used to preclinically test a variety of treatments in vivo. Murphy, K. A., James, B. R., Wilber, A., Griffith, T. S. A Syngeneic Mouse Model of Metastatic Renal Cell Carcinoma for Quantitative and Longitudinal Assessment of Preclinical Therapies. J. Vis. Exp. (122), e55080, doi:10.3791/55080 (2017). Renal cell carcinoma (RCC) affects > 60,000 people in the United States annually, and ~ 30% of RCC patients have multiple metastases at the time of diagnosis. Metastatic RCC (mRCC) is incurable, with a median survival time of only 18 months. Immune-based interventions (e.g., interferon (IFN) and interleukin (IL)-2) induce durable responses in a fraction of mRCC patients, and multikinase inhibitors (e.g., sunitinib or sorafenib) or anti-VEGF receptor monoclonal antibodies (mAb) are largely palliative, as complete remissions are rare. Such shortcomings in current therapies for mRCC patients provide the rationale for the development of novel treatment protocols. A key component in the preclinical testing of new therapies for mRCC is a suitable animal model. Beneficial features that recapitulate the human condition include a primary renal tumor, renal tumor metastases, and an intact immune system to investigate any therapy-driven immune effector responses and the formation of tumor-induced immunosuppressive factors. This report describes an orthotopic mRCC mouse model that has all of these features. We describe an intrarenal implantation technique using the mouse renal adenocarcinoma cell line Renca, followed by the assessment of tumor growth in the kidney (primary site) and lungs (metastatic site). Renal cell carcinoma (RCC) accounts for the majority of malignant kidney neoplasms and roughly 3% of all adult malignancies worldwide1,2. Due to lack of symptoms, misdiagnosis, and insufficient screening tools for RCC, almost 30% of patients will present with metastatic RCC (mRCC) at the time of diagnosis, with an additional 20-30% of patients progressing to a metastatic stage2. These cases result in ~13,500 deaths annually1,3. Though earlier detection and treatment of primary RCC has improved, the rate of RCC-related death continues to increase, suggesting that metastatic disease is largely responsible for mortality3. Therapy development for RCC has progressed over the last decade with the discovery and implementation of targeted therapies and immunotherapies. Unfortunately, progression-free survival and overall survival of advanced cases are still well under 2 years for the majority of patients4,5,6. These statistics warrant the need for further research into the identification and development of efficacious treatments for RCC. To adequately advance therapeutic interventions for mRCC, translationally-relevant pre-clinical models of the disease are first needed. Development of a relevant and consistent model to recapitulate the human condition of advanced RCC should address several key questions: 1) Is the model anatomically relevant; 2) Does the tumor progress similarly to the human pathology; 3) Do metastases arise from the primary tumor; and 4) Can primary and metastatic tumor progression be monitored over time? Depending on the type of treatment being investigated, mouse RCC tumor cell lines, human RCC tumor cell lines, and human RCC patient-derived xenografts may be used in immunocompetent or immunodeficient mice. A host with an intact and functional immune system is required for those studies evaluating some aspect of immunotherapy, necessitating the use of the well-described Renca cell line derived from a spontaneous renal adenocarcinoma of Balb/c mice7. Most studies inject Renca cells subcutaneously (s.c.), which forms an easy-to-measure local tumor, or intravenously (i.v.) into Balb/c mice to produce experimental lung "metastases"8,9,10,11,12. Use of an s.c.-implanted Renca tumor to model human RCC has a number of limitations, including inaccurate innervation of vasculature13, differences in microenvironment14,15, and a lack of organ/tumor cellular communication13,16. Additionally, many s.c. tumors (especially Renca) do not metastasize to distal organs, inhibiting the study of an event that is a common clinical characteristic17. To study mRCC, Renca cells can be injected i.v. to establish tumor burden in the lungs-the primary location of metastases in RCC patients. The i.v. injection method of initiating metastatic tumors, however, does not allow the investigation of how, when, or why the cells have migrated from the primary organ (i.e., the kidney) to the distant site. A model with both primary and metastatic disease evident in the same animal is crucial to study the progression and treatment of advanced disease, especially considering that metastases are typically the cause of mortality in these patients. Our lab has developed a murine model of mRCC that incorporates all of the features outlined above. To establish primary, orthotopic tumors, Renca cells are implanted directly into the kidney of the animal through the translucent peritoneum. A small incision in the left flank allows for visualization of the spleen (as a landmark) and the left kidney. Using a small-gauge needle, Renca tumor cells are injected directly into the kidney through the peritoneum for orthotopic implantation. Compared to other methods of implanting Renca cells below the kidney capsule18, this method of implantation allows for a higher throughput, as it is fairly non-invasive, does not require suturing, is of a low pain class, and is time-efficient when practiced. This well-characterized model results in reproducible primary tumor burden (~ 99% take rate) in the injected kidney as well as metastatic tumor load in the lungs. The significant advantages of this model include its syngeneic nature, allowing for immunotherapy investigations; its spontaneous metastases, to study advanced disease; and its orthotopic implantation, to model the anatomical impact on disease progression and treatment. Therapies aimed at targeting RCC would greatly benefit from the utilization of this model during preclinical development. The following protocol describes an experimental procedure for inducing and monitoring the growth of experimental orthotopic renal tumors and any potential spontaneous metastases. All of the following procedures are done in accordance with institutional policies and approved procedures regarding the humane use of experimental animals. Maintain murine renal adenocarcinoma cell line, Renca, in Roswell Park Memorial Institute (RPMI) 1640 medium supplemented with 10% fetal calf serum (FCS), 1% penicillin-streptomycin, and 1 mM each of non-essential amino acids, L-glutamine, and sodium pyruvate (referred to as complete RPMI). Culture cells in an incubator at 37 °C and 5% CO2. NOTE: As with any established cell line, it is recommended to use low passage-number Renca cells for transfection and subsequent implantation to minimize any phenotypic or genetic changes that could occur after long-term culture. Use a transposon system to engineer Renca cells to stably express green fluorescent protein (GFP) and firefly luciferase. Using a cationic liposome-based transfection reagent, co-transfect Renca cells with a transposase expression vector (pPGK-SB11) and a transposon vector encoding for the expression of firefly luciferase, as well as a fusion gene encoding for GFP and the zeocin resistance gene, both under the transcriptional control of a bi-directional promoter (pKT2/LuBiG)19. Two days later, plate the transfected cells at a limiting dilution and allow the cells to expand in complete RPMI supplemented with zeocin (300 µg/mL). Confirm GFP expression in each clone by flow cytometry. These cells are termed Renca-GL. NOTE: Limiting-dilution cloning will permit the selected cells to be derived from a single cell. To implant Renca cells intrarenally, prepare Renca cells into a single-cell suspension at 2 x 106 cells/mL in Hank's Balanced Salt Solution (HBSS). Remove adherent Renca cells from the tissue culture flask using 0.25% trypsin in HBSS. After ~ 5 min, add complete RPMI to the flask to neutralize the trypsin and transfer the cells to a centrifuge tube for washing. Centrifuge the cells at 300 relative centrifugal g force (rcf x g) for 5 min at 25 °C. Decant the supernatant and resuspend the cells in HBSS. Count the cells using a hemocytometer and adjust the volume with HBSS to yield 2 x 106 cells/mL. Draw the cells into a 1-mL syringe fitted with an 18-gauge needle to prevent shear stress on the cells. Replace the 18-gauge needle with a 28-gauge needle prior to the injection of the tumor cells. An injection of 0.1 mL delivers 2 x 105 cells into the kidney. Prepare a sterile surgical area in a biosafety cabinet by placing a sterile surgical drape over a heating pad. Gather all supplies, including forceps, scalpel, scissors, eye drops, 5% povidone-iodine antiseptic, and sterile gauze. Autoclave all instruments prior to use. Perform the surgery using an aseptic tip technique. Resterilize instruments between animals with a bead sterilizer. Wear sterile gloves, a lab coat, and a face mask. Anesthetize the mice with ketamine/xylazine (87.5 mg/kg and 12.5 mg/kg, respectively, i.p.) according to institutional guidelines. Determine anesthetic depth by performing a toe-pinch. When the animal is considered non-responsive, prepare the injection site (e.g., left flank) on Balb/c mice by plucking (with fingers) or shaving (using clippers) the fur. Move the mice from the surgery prep area (e.g., the housing cage) to the surgical area and apply vet ointment to the eyes to prevent dryness. Liberally swab the prepared incision site with 5% povidone-iodine antiseptic. Inject bupivacaine hydrochloride (0.1 mL of a 2.5 mg/mL solution, s.c.) into the area where the incision will be made as a pre-operative analgesia. Make a single incision (~ 1.0 - 1.5 cm) on the left flank of the animal using a sterile scalpel or scissors, carefully so as not to penetrate the peritoneum. Separate the dermis from the peritoneum with sterile scissors. Dab the incision site with sterile cotton gauze to remove any blood. Hold the mouse with both hands, using the left hand to hold the head and the right hand to support the flank. Identify the spleen through the peritoneum and, with one finger of the right hand, palpate the mouse from underneath; the kidney should now be visible through the peritoneum. Keep a firm hold of the animal to provide tension across the peritoneum and kidney. Have a second person inject the tumor cells (prepared in section 1.2.) through the intact peritoneum into the center of the kidney using a 1-mL syringe fitted with a 28-gauge needle. Slowly deliver 0.1 mL (2 x 105) of cells. Once the cells are injected, hold the needle in place for 5 - 10 s to reduce the backflow of cells. It is important to note the need for extreme caution during this step, as the person injecting the cells will bringing the needle into close proximity to the fingers of the person holding the mouse. Remove the needle and close the incision with a thin layer of cyanoacrylate tissue adhesive. Place the animal back into a clean cage with a sterile paper towel. Allow the animals to recover on a heating pad. Do not leave the animals unattended during the recovery period. Do not return the animals to standard housing conditions until they are upright and sternal. Follow institutional guidelines in all procedures using laboratory animals. Monitor tumor growth by bioluminescent imaging. NOTE: Procedural details for performing bioluminescent imaging can be obtained from Lim et al.20 The luciferase signal can be detected as early as 24 h after tumor cell implantation. As there is no externally-visible tumor in this model, it is essential to monitor tumor growth periodically. Depending on the designed experiment, orthotopic tumor growth can proceed for varying lengths of time. One benefit of using the luciferase-expressing Renca cells is that tumor growth can be repeatedly monitored in the same animal at regular intervals for the duration of the experiment, and a specific interrogation of tumor-bearing and tumor-free organs can be done at a defined endpoint. Inject luciferin (0.1 mL of a 15 mg/mL solution in sterile PBS) i.p. and allow it to circulate for 10 min before placing the mouse into the bioluminescence imaging system. Place the mouse with its dorsal side up, rolled slightly on its side, in order to have the injected kidney facing up. Measure the tumor burden in photons of light emitted per second (photon flux) within a defined region of interest (r.o.i.) using image analysis software. Quantitation of tumor burden in individual organs. NOTE: Quantitation can be performed at defined time points in individual organs after their removal from euthanized mice. Inject the mice with luciferin, as in step 4.1. After 10 min, euthanize the mice using an approved procedure. Dissect out the organs of interest (e.g., the kidneys and lungs; see section 5 below). Transfer the tissue to 35 x 10-mm Petri dishes and place them into the bioluminescence imaging system. Measure the tumor burden in photons of light emitted per second (photon flux) within a defined r.o.i. using image analysis software. At a defined endpoint for the individual experiment, euthanize tumor-bearing mice according to preferred institutional guidelines (e.g., CO2, cervical dislocation, anesthesia overdose). However, avoid cervical dislocation if lungs are to be collected after India ink inflation. Perform a gross assessment of primary renal tumor growth in the injected kidney by measuring the wet organ weight. To determine the tumor mass (in g), isolate21 and weigh the tumor-bearing kidney and the contralateral kidney from the same mouse, where the difference in kidney weights defines the tumor mass. Carefully dissect away any extraneous connective tissue from the excised kidneys before measuring their weights. Assess the degree of tumor metastasis to the lungs by inflating the lungs with India ink prior to excision and immediately fixing the lungs in Fekete's solution22. Manual calculation of metastatic lesions on the lung surface can then be performed. Make a midline incision using scissors starting at the mid-abdomen, through the ribcage, and up through the neck/salivary glands. Carefully remove the rib cage using scissors and forceps, without compromising the lung tissue. Expose the trachea by removing the connective tissue. Prepare a 3 mL syringe with an 18-gauge needle filled with 10% India ink solution in HBSS. Using forceps, carefully thread a silk suture under the trachea. This will be used to tie off the trachea once inflated. Carefully insert the needle down the trachea and slowly depress the syringe to inflate the lungs with the India ink solution. Approximately 1 - 1.5 mL of India ink solution will fully inflate the lungs. Pinch the trachea shut by tying several knots, with the suture below the needle to inhibit the backflow of the ink. Remove the needle and carefully cut away the connective tissue to remove the inflated lungs. In a chemical fume hood, place the lungs into a 15-mL conical tube containing 5 mL of Fekete's solution (35 mL of 95% EtOH, 15 mL of dH2O, 5 mL of formaldehyde, and 2.5 mL of glacial acidic acid in a 100-mL glass bottle)23. Allow the lungs to fix/destain for 24 - 48 h at room temperature prior to manually counting the destained tumor nodules. Remove the intact lungs after destaining and carefully dissect the fixed lungs by lobe in a 35 x 10 mm Petri dish. Count the number of tumor nodules (white nodules) on each lobe under a dissecting microscope. The successful implantation of Renca cells will result in tumor development in the kidney and metastasis to the lungs of the mice. 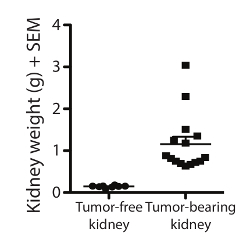 After the excision of the tumor-bearing and the contralateral kidneys, wet tissue weights (g) were measured to demonstrate the tumor burden based on increased weight (Figure 1). Renca tumors can be identified by immunohistochemistry through cytokeratin 8 and 18 staining (Figure 2). For longitudinal studies, a luciferase-expressing Renca cell line was implanted. Bioluminescent imaging was performed using an in vivo imaging system (IVIS) to track tumor burden and response to therapy over time (Figure 3A). Metastasis to the lungs was confirmed by bioluminescent imaging (Figure 3B) and India ink lung inflation (Figure 3C). Figure 1. Orthotopic implantation of Renca tumor cells forms a large renal mass. 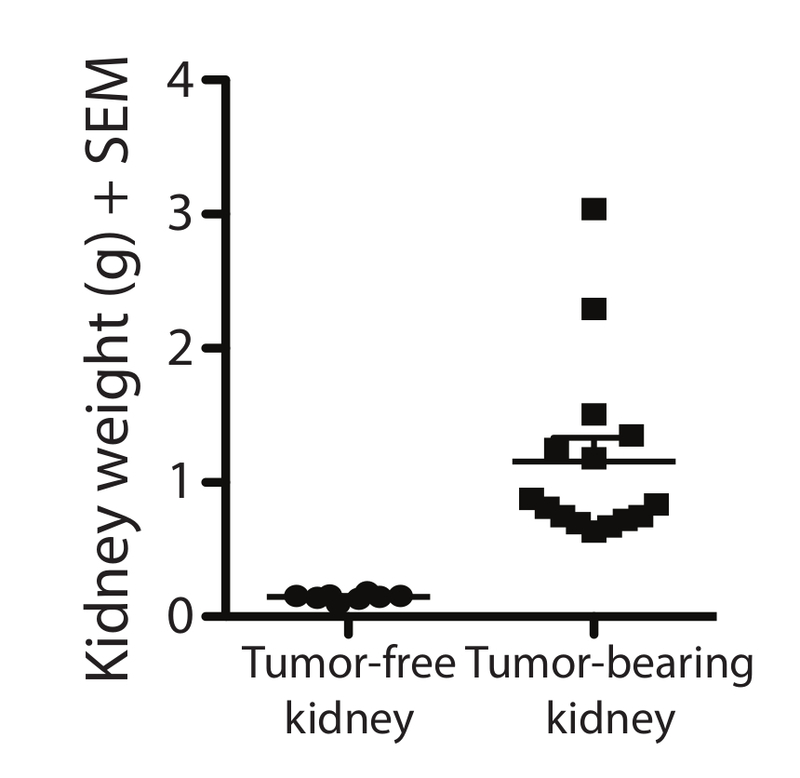 Renca-GL cells (2 x 105 in 0.1 mL) were injected intrarenally, and the weights of the excised tumor-bearing kidneys and tumor-free contralateral kidneys in grams (+SEM) were determined on day 24. n = 15 tumor-free and tumor-bearing kidneys. Please click here to view a larger version of this figure. Figure 2. Immunofluorescent microscopic image of tumor-free contralateral and tumor-bearing kidneys. Renca-GL cells (2 x 105 in 0.1 mL) were injected intrarenally, and the tumor-bearing and tumor-free kidneys were harvested on day 12. The kidneys were snap-frozen and processed for immunofluorescence imaging to visualize the location of collagen, cytokeratin 8 and 18, and CD31. 10x images were taken and stitched together to view the entire tumor-bearing kidney. Scale bars = 1 mm. Please click here to view a larger version of this figure. Figure 3. Orthotopic implantation of Renca tumor cells leads to spontaneous lung metastases. A. Renca-GL cells (2 x 105 in 0.1 mL) were injected intrarenally into Balb/c mice. Bioluminescent images were taken on the indicated days. B. On day 23, the lungs from tumor-free and tumor-bearing mice were excised and bioluminescent images were taken. C. Parallel sets of mice on day 23 had their lungs inflated with India ink to visualize lung tumor nodules. Scale bars = 1 cm. Please click here to view a larger version of this figure. We present a protocol for an orthotopic RCC mouse model. Implantation of mouse renal adenocarcinoma tumor cells into the mouse kidney provides a clinically-relevant model of mRCC. This model results in a primary tumor within the kidney and distant metastasis in the lungs, both of which are hallmarks of advanced RCC. The description presented herein is specific for the Renca cell line in immunocompetent Balb/c mice. Using this orthotopic model, we have shown that the Renca tumors are responsive to immunotherapy, demonstrating the usefulness of this model for therapeutic testing17,24,25,26,27. The ability to use a syngeneic tumor cell line for implantation provides the advantage of studying tumor progression in an immunologically intact animal. The syngeneic, orthotopic, and clinically-relevant characteristics of this system provide a superior model that allows for the testing of therapies in a relevant pre-clinical model. This cannot be replicated when the tumors are implanted subcutaneously. It is important to mention that such a modeling system is not limited to evaluating anti-tumor immune responses or various immunotherapeutic approaches for treating RCC. It would be feasible to use human tumor cells implanted intrarenally into immunodeficient mice, depending on the type of experimentation being conducted. The availability of established RCC cell lines that can be cultured in vitro improves the reproducibility of this in vivo orthotopic model, as all animals can be implanted with an equal number of tumor cells at the same time. Furthermore, the tumor cells can be manipulated in vitro prior to intrarenal implantation offering the possibility to control how the cells grow and/or respond to environmental signals. One limitation with this (and most) implantable tumor models is that they circumvent the early events responsible for tumor formation, a benefit that is afforded by using a mouse model genetically engineered for the formation of autochthonous tumors. One drawback of the orthotopic model is the general inability to visualize tumor growth, a feature that is easily monitored for an s.c. tumor by caliper measurement. Current technology using genetically-engineered tumor cells and bioluminescent imaging allows for longitudinal measurements of internal tumors. We have demonstrated the ability to determine primary renal tumor and metastatic burden at various time points based on bioluminescent imaging and/or organ extraction17,24,25. A strength of our model is the availability of the GFP and luciferase-expressing Renca cell line, but the model does not require this feature for success. We have characterized the orthotopic RCC model with both parental Renca and Renca-GL cells. Following implantation of Renca-GL cells, primary tumors can be readily measured by bioluminescent imaging. It can be difficult to monitor metastases in the whole animal, however, as the primary tumor can produce a signal that overwhelms the lower signals that might be emitted from the metastatic site. Excising and imaging the individual organs from the whole animal allows for the visualization and quantification of metastases in those organs. In the Renca orthotopic model, the primary kidney tumors give rise to spontaneous micro-metastases in the lungs of the animals as early as 7 days post-implant, as seen by luminescence in the excised lung tissue17. While the use of a luciferase-expressing tumor cell line in this system provides the user with the ability to track tumor progression longitudinally in the same animal, it also provides the user with the ability to evaluate the precision of the implantation technique. The mouse kidney is a small anatomical structure, making it possible, especially when using a long needle, to inject the tumor cells through the kidney and directly into the peritoneum. Imaging the mouse within several days of injection determines the extent to which the implantation of the tumor cells is localized to the kidney. Another feature that can complicate the intrarenal injection is the presence of an abundance of visceral fat, which can accumulate as the animal ages. The kidney is easily visible through the peritoneum in a lean mouse, but the kidney can become obscured under lobes of visceral fat that can develop over time. At the termination of a given experiment, a number of assessments can be used to determine the whole-body tumor burden. 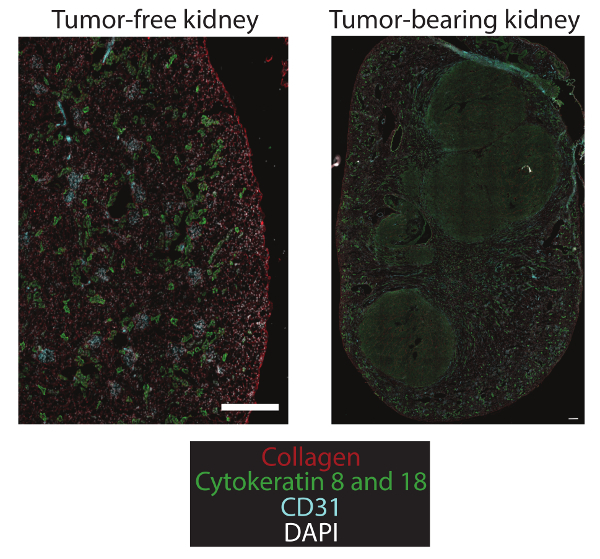 Bioluminescent imaging of the excised organs provides an objective measure of tumor burden. The wet weight of primary tumors normalized to the contralateral kidney as an internal control provides a bulk mass measurement. The metastatic burden in the lung can also be determined by inflating the lungs with India ink en bloc to allow for the visualization of white lung tumor nodules using a dissecting microscope. These readouts can establish total-body tumor burden, which can be used as a baseline for investigating the therapeutic efficacy at the pre-clinical stage of drug development. The expression of GFP by the Renca-GL cells also lends itself to flow cytometric analyses of the tumor-bearing tissues. However, caution must be exercised for any flow cytometric assessment of the tumor-bearing kidney, especially when investigating the composition and magnitude of any immunological response generated as a consequence of therapy. Kidneys are highly vascular organs, making it likely that evaluation of the immune response (either pro-tumor or anti-tumor) in the whole tumor-bearing kidneys will include both "tissue- and vasculature-localized" immune cells at the time of organ harvest. To distinguish tissue versus blood immune cells, we use a technique where fluorochrome-labeled anti-CD45.2 monoclonal antibody (mAb) is injected i.v. before euthanasia. The kidneys are then prepared for flow cytometry, which includes ex vivo staining with different fluorochrome-labeled anti-CD45.2 mAb28,29. Dual CD45.2 staining discriminates cells within the vasculature from the tissue at the time of harvest. This simple protocol enables the identification of major leukocyte lineages contained within the vasculature that might otherwise confuse the interpretation of adaptive and innate immune responses in tissues. This protocol also eliminates the need for perfusion, which may have unintended consequences28,29. There is currently an increased appreciation for and use of immunotherapy to treat cancer. The development of future immunologically-based treatments for mRCC (and other cancers) starts in the laboratory using a clinically- and physiologically-relevant model. The orthotopic RCC model described herein contains a number of key features (e.g., primary renal tumor, distant metastases, tumor-induced immune suppression, and components for longitudinal monitoring of tumor growth) for testing the efficacy of a variety of therapeutic modalities. It is also tempting to speculate that this model could be adapted in the future to evaluate advances in other means of treating RCC, such as surgical and/or focal therapy protocols. This work was supported by grants from the National Cancer Institute (R15CA173657 to A.W. and R01CA109446 to T.S.G. ), the Simmons Cancer Institute (to A.W. ), and the University of Minnestoa Climb 4 Kidney Cancer Foundation (to T.S.G.). We thank Dr. Kristin Anderson for assistance with the immunofluorescence. Siegel, R. L., Miller, K. D., Jemal, A. Cancer statistics. CA Cancer J. Clin. 66, 7-30 (2016). Chow, W. H., Dong, L. M., Devesa, S. S. Epidemiology and risk factors for kidney cancer. Nat. Rev. Urol. 7, 245-257 (2010). Hollingsworth, J. M., Miller, D. C., Daignault, S., Hollenbeck, B. K. Rising incidence of small renal masses: a need to reassess treatment effect. J. Natl. Cancer Inst. 98, 1331-1334 (2006). Lee-Ying, R., Lester, R., Heng, D. Current management and future perspectives of metastatic renal cell carcinoma. Int. J. Urol. 21, 847-855 (2014). Rini, B. I. New strategies in kidney cancer: therapeutic advances through understanding the molecular basis of response and resistance. Clin. Cancer Res. 16, 1348-1354 (2010). Acquavella, N., Fojo, T. Renal cell carcinoma: trying but failing to improve the only curative therapy. J. Immunother. 36, 459-461 (2013). Salup, R. R., Wiltrout, R. H. Adjuvant immunotherapy of established murine renal cancer by interleukin 2-stimulated cytotoxic lymphocytes. Cancer Res. 46, 3358-3363 (1986). Ko, J. S., et al. Direct and differential suppression of myeloid-derived suppressor cell subsets by sunitinib is compartmentally constrained. Cancer Res. 70, 3526-3536 (2010). Kusmartsev, S., et al. Oxidative stress regulates expression of VEGFR1 in myeloid cells: link to tumor-induced immune suppression in renal cell carcinoma. J. Immunol. 181, 346-353 (2008). Rocha, F. G., et al. Endostatin gene therapy enhances the efficacy of IL-2 in suppressing metastatic renal cell carcinoma in mice. Cancer Immunol. Immunother. 59, 1357-1365 (2010). Shanker, A., et al. Treating metastatic solid tumors with bortezomib and a tumor necrosis factor-related apoptosis-inducing ligand receptor agonist antibody. J. Natl. Cancer Inst. 100, 649-662 (2008). VanOosten, R. L., Griffith, T. S. Activation of tumor-specific CD8+ T Cells after intratumoral Ad5-TRAIL/CpG oligodeoxynucleotide combination therapy. Cancer Res. 67, 11980-11990 (2007). Bibby, M. C. Orthotopic models of cancer for preclinical drug evaluation: advantages and disadvantages. Eur. J. Cancer. 40, 852-857 (2004). Devaud, C., et al. Tissues in different anatomical sites can sculpt and vary the tumor microenvironment to affect responses to therapy. Mol. Ther. 22, 18-27 (2014). Devaud, C., et al. Differential potency of regulatory T cell-mediated immunosuppression in kidney tumors compared to subcutaneous tumors. Oncoimmunology. 3, 963395 (2014). Devaud, C., et al. Cross-talk between tumors can affect responses to therapy. Oncoimmunology. 4, 975572 (2015). Norian, L. A., et al. Eradication of metastatic renal cell carcinoma after adenovirus-encoded TNF-related apoptosis-inducing ligand (TRAIL)/CpG immunotherapy. PLoS One. 7, 31085 (2012). Matin, S. F., et al. Immunological response to renal cryoablation in an in vivo orthotopic renal cell carcinoma murine model. J. Urol. 183, 333-338 (2010). Wilber, A., et al. RNA as a source of transposase for Sleeping Beauty-mediated gene insertion and expression in somatic cells and tissues. Mol. Ther. 13, 625-630 (2006). Lim, E., Modi, K. D., Kim, J. In vivo bioluminescent imaging of mammary tumors using IVIS spectrum. J. Vis. Exp. (2009). Skrypnyk, N. I., Harris, R. C., de Caestecker, M. P. Ischemia-reperfusion model of acute kidney injury and post injury fibrosis in mice. J Vis Exp. (2013). Zimmerman, M., Hu, X., Liu, K. Experimental metastasis and CTL adoptive transfer immunotherapy mouse. J. Vis. Exp. (2010). Wexler, H. Accurate identification of experimental pulmonary metastases. J. Natl. Cancer Inst. 36, 641-645 (1966). James, B. R., et al. CpG-mediated modulation of MDSC contributes to the efficacy of Ad5-TRAIL therapy against renal cell carcinoma. Cancer Immunol. Immunother. 63, 1213-1227 (2014). James, B. R., Brincks, E. L., Kucaba, T. A., Boon, L., Griffith, T. S. Effective TRAIL-based immunotherapy requires both plasmacytoid and CD8a DC. Cancer Immunol. Immunother. 63, 685-697 (2014). James, B. R., et al. Diet-induced obesity alters dendritic cell function in the presence and absence of tumor growth. J. Immunol. 189, 1311-1321 (2012). Brincks, E. L., et al. Triptolide enhances the tumoricidal activity of TRAIL against renal cell carcinoma. FEBS J. 282, 4747-4765 (2015). Anderson, K. G., et al. Cutting edge: intravascular staining redefines lung CD8 T cell responses. J. Immunol. 189, 2702-2706 (2012). Anderson, K. G., et al. Intravascular staining for discrimination of vascular and tissue leukocytes. Nat. Protocols. 9, 209-222 (2014).